Recently retired IDF chief of staff Gadi Eisenkot said Monday that Israel came close to all-out conflict with Hezbollah during his tenure. 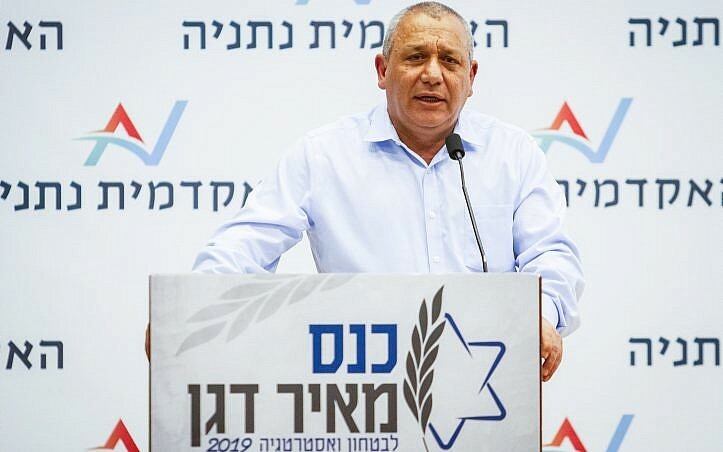 Speaking at a security conference in Netanya, Eisenkot said tensions with the Iran-backed terror group that controls much of Lebanon almost erupted into a hot war on more than one occasion. “There were not a few instances and days where the distance between those events and escalation to the point of war or battle was a hair’s breadth,” Eisenkot was quoted saying by Hebrew-language media. Israel last fought a war with Hezbollah in 2006, but tensions along the northern border have remained high. Israel has for years carried out airstrikes in Syria to prevent weapons transfers to the Iran-backed terror group. The end of Eisenkot’s four-year tenure was marked by an Israeli operation to destroy a network of tunnels under the Lebanese border Israel says were dug by Hezbollah for a future attack. There were several occasions in which Israeli soldiers worked mere meters from Hezbollah operatives across the border. “The Hezbollah threat is a serious threat,” Eisenkot told the conference. “It is a strong organization that has gained experience in running large operations and wants to prepare an attack plan to conquer the Galilee and bring 5,000 fighters underground” into Israel. The threat of war with Hezbollah had increased during the last three years, he said. The retired general said the Hezbollah tunnel threat was identified years ago and acted on last December, when Israel launched Operation Northern Shield to find and destroy Hezbollah cross-border attack tunnels. Hezbollah has denied that the tunnels were part of a new attack plan, or that Israel’s destruction of them was a major blow to the group’s operations. “The uncovering of the tunnels does not affect by 10 percent our plans to take over the Galilee. If we decide to do it — even if they’ve destroyed the tunnels — can’t we rebuild them,” Hezbollah leader Hassan Nasrallah claimed in January. He also suggested there may be attack tunnels on the Israeli-Lebanese border that Israel has not yet discovered. During his term as army chief, which began in February 2015, Eisenkot said, “the crowning glory of security activity was the thwarting of the Iranian nuclear program.” He did not elaborate. The deal between Iran and world powers to curb Tehran’s nuclear ambitions was signed half a year into his stint as chief of staff. However, he warned, there was no disputing the Iranian desire to achieve nuclear capability in the future. Eisenkot also warned that conventional warfare remains a threat to Israel and despite their disintegration during the civil war, the Syrian armed forces were expected to recover. “There is no doubt that within three to five years we will see an improvement in the Syrian army, which has already begun a rehabilitation process and which is a threat that will continue to occupy the IDF,” Eisenkot said. Eisenkot asked to shorten his year-long end-of-service paid leave and end it this month, raising speculation he seeks to make himself eligible to run for political office sooner than expected. The former top soldier left active service as chief of staff on January 15 and was to begin a year of paid leave until January 2020, but instead will be free of the army by April. Senior military officials are required to wait a three-year cooling-off period before they are allowed to run for office. Eizenkot has denied political ambitions and said the reason for the move was to make it easier for him to the join the US-based Washington Institute for Near East Policy as a fellow later this year. This entry was posted on March 19, 2019 at 11:30 AM and is filed under Uncategorized. You can subscribe via RSS 2.0 feed to this post's comments. You can skip to the end and leave a response. Pinging is currently not allowed.